I’ve lived in California, Oregon, Tennessee, Florida, Georgia, and Washington D.C. In my life I have been a musician, restaurateur, teacher, museum specialist, gallerist, lobbyist and founder of thirteen art festivals. I’m a father, grandfather and provider for a very large dog. The common thread throughout these various careers and locales is my love of painting for the last 30 years. I enjoy the seclusion and intuitive process of painting and challenging my own perception and skills. Whether depicting a stark environment or the contrast of urban encroachment, my painter’s eye sees the world from the perspective of a landscape composition with endless interpretations. Living in Cambria on California’s Central Coast provides bountiful inspiration but it’s the reflections on our precarious relationship with nature that prompts me to explore ways to render the evolution. 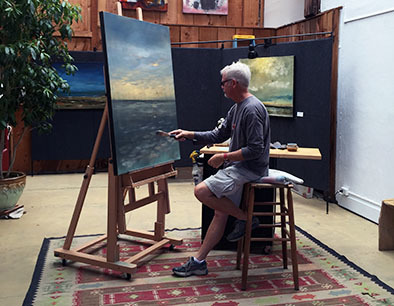 Rather than painting alone at home, I paint in a public studio space and display my work there. This serves to engage the public in my process. As a result I stop and start frequently and must rely on memory to render those layers on canvas. 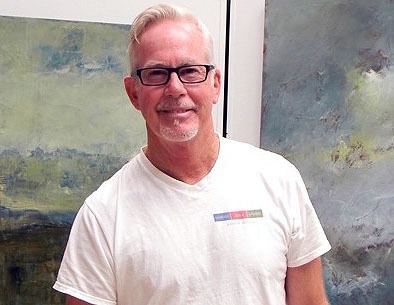 I also travel to juried art festivals and exhibitions to show my paintings. It is important for me to create an engaging, yet tranquil painting that conveys an impression of the struggle between nature and our encroaching urbanization. Hard edges and texture are contrasted with soft hues and ambiguous compositions. The genesis of each painting involves re-appropriating memories of a real place from fragmented or overlapping timelines to inform the layers of paint. The excavation process uncovers and exposes elements from the original composition resulting in a finished product that represents a suggestion of the original intent. Memories, after all become obscured, losing sharpness over time; thus the impressionistic results. After priming a clean canvas I often sketch in the composition using black gesso, then let it run. This ingredient will inform the surface. I start with a “real” place in mind, and then edit the details with each layer until the result is an impression. Mixing varnish with paint, I apply underlayment of random torn paper. I often use sheet music, poetry, newsprint or tissue forming a mosaic collage pattern knowing this layer will almost certainly be obscured or covered by subsequent layers of paint. I began using paper under my paint to create stable textured substrata. Once the foundation has cured, I chip, peel and sand off any loose materials. 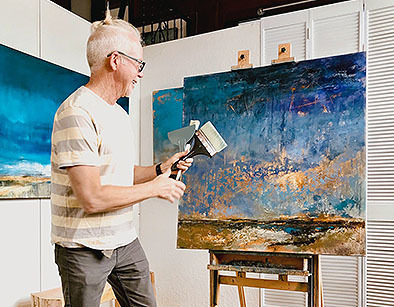 Up to six additional layers of paint will be applied to create an atmospheric or abstract landscape composition using brushes, scrapers, palette knives and feathering tools. Layers may be excavated to expose the underlying surface, adding relevance and depth to the finished piece.